16-18" tall, Double Late Tulip Bulbs Pink Star is one of the most spectacular tulips available. The flowers have so many petals that their more common name is Peony Tulips. Double Late Tulips bloom in the late spring season and are very long lasting; they even often bloom well into early summer. Lance to oval-shaped green leaves. Yes - Bulbs, blooms, leaves, and stems all contain toxic compounds, which are most concentrated in the bulb. What is a "Quality Bulb," and Why Does Bulb Quality Matter? 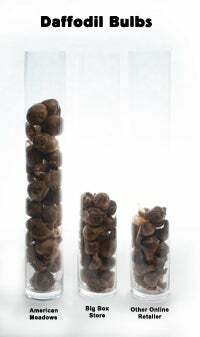 Flower bulbs come in a wide variety of sizes. It is important to get the largest, best quality bulbs you can find. Larger bulbs help to ensure success, producing larger and stronger plants with more flowers. Several flower bulbs are part of the onion family, and because of this I like to use Onions as a representation of how important bulb size is. Which of the onions on your shelf go bad first? The smallest ones! Larger onions are more resilient, taking longer to dry out/rot and can withstand swings in temperature better. Flower bulbs are the same. Larger bulbs will withstand disease, draught, large amounts of moisture, and colder temperatures significantly better than the smaller ones. 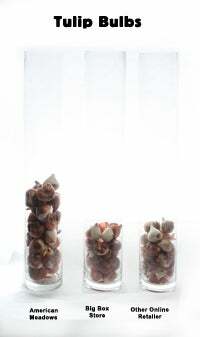 Each of the glass tubes contains 20 Dutch Master Daffodils. Starting from the left, the first tube is what is sold here at American Meadows, the middle tube was purchased at a local “Home Supply” box store, and the third is another online retailer. The difference is easily noticeable. Again, our bulbs are quite a bit larger than other retailers. Other things to be aware of when it comes to bulb quality is making sure they are firm and without signs of external damage or cracking. Do your best to avoid bulbs that are already growing and have shoots or freshly grown roots. This is difficult when purchasing online, but if you are ordering through a reputable company, they should be checking for these things regularly. Next time you are looking to buy bulbs, think about how much time you put into planning and planting your garden and then anxiously waiting for your flowers to grow and bloom. Don’t be disappointed after all that effort by planting sub-par bulbs. Buy the largest, firmest, disease free bulbs you can afford, and you will have the best possible results.